My friend, Jodi, at Heart Like a Dog blog has been sharing some of her old past blog posts for Throwback Thursday and I love it so much! In fact, it has inspired me to revisit some of my own old blog posts and share some of them with you. Talking Dogs has been around since 2007. Today I want to share with you my all time most popular blog post with 76,498 views. Ironically, this is a post that I did not write, but a guest post from the Dog Daddy. Without further ado, here's Remembering An Old Friend, originally published on January 13, 2012. Today we have a Talking Dogs guest post from the dog daddy at our house, known to some of you as the Chief Medical Examiner and my husband, Gary. Having recently lost Tucker, my old friend of 14 years, I have been thinking a lot about him. A few weeks ago, while stringing lights on the Christmas tree, I was remembering one of the last walks we took together. We have a fenced back yard of about two acres which the dogs have access to. However they all love to go for a walk outside of the yard with their daddy. Nobody loved the walks more than Tucker. The last few years of his life he was suffering with arthritis and got to the point where he had trouble standing up, but once he was on his feet he was always ready to go for a walk. I regret terribly that we didn’t take more walks. Once we were out the front door Tucker was on the move. Slow and steady but moving ahead. Regardless of how long the walk lasted or how tired he was, he never once asked to go back to the house. When I would tire out and start back, he would always want to go for more. On one of those last walks together Tucker scared up a rabbit. I saw it lying in the grass long before Tucker did so I steered him toward it. Now, to help you get the image, it helps to visualize a 98 year old man who needs a walker to get around. Although Tucker didn’t have a walker (he could have used one) he walked very slow and deliberate as he made sure each step was secure. When Tucker got about 6 feet from the rabbit it bolted and ran. Tucker came alive and gave chase. Well at least until he got to the end of the leash and I stopped him. He watched as the rabbit hopped off and into the high grass and was gone. In hindsight I wish I would have let him go. One last good chase. It’s not as if he would have caught the rabbit or even got close but he would have loved to try, and I know he would not have gone too far in his condition. But it’s too late now and it makes me sad that my basic instinct to keep control of him deprived him of that good chase. I should add that we were about in the middle of our 46 acres so he would have had plenty of room to safely chase the rabbit. You see, for years one of Tuckers jobs around here was to keep the yard clear of all invading critters, rabbits, armadillos, squirrels. He had retired from that job and had turned it over to the young and swift. But when Tucker saw that rabbit he was young again. Age nor ability was not a thought. I wish I had let him go. What a great post to revisit. I bet tucker is chasing all the rabbits in heaven now. What a great post. It got the leaky eyes going here. Mom said Katie also tried to get a wabbit a few weeks before she passed away. She was always off leash at that point and made the choice to chase. Unfortunately for her, she was only able to run about three steps, but it showed she never gave up her will to keep on trying. My eyes were pretty leaky, too. Katie had a strong life force. She and Tucker are chasing those wabbits now! Oh Sue! I loved this post, it brought tears to my eyes. Watching Sampson age and struggle is challenging. There is SO much in me that says, "let him off-leash, let him run and wrestle with Delilah and have a go at his beloved woods" BUT then there is that bit of me that says, "You don't want him hurting or damaging himself and then spend the last bit of his life suffering." It's such a fine line. I'm sorry that Gary has regrets with Tucker, but I hope the wonderful memories and walks where he did chase the rabbit help get him through it. Thanks for the shoutout, I'm in a bit of a funk and can't even manage a TBT right now. It's hard. The last year of his life, Jeffie wasn't allowed to play with Rudy, run and rumble to his heart's content. Little did I know that the acl injury wasn't the real heart breaker. I'm glad I limited his activity - gave me longer with him. You're welcome for the shout out. I'm planning to do more TBT posts because it's a fun walk down memory lane. Pretty sure there's a barking good pawty in heaven :-) Thanks, Denise. I got a case of leaky eyes when I re-read it. This brought tears to my eyes. 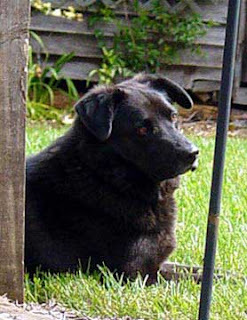 It's so tough to know how much we should let our older dogs do, and of course our first instinct is to keep them safe. Wow, you have been at this for a long time! I hope you keep it going and keep sharing some of your older posts too. I know my first instinct is protection and sometimes I look back and think it was probably over-protection. But, who knows? We all do the very best that we can at the time, right? Thanks, Jan, for the encouragement. I love Jodi's idea about "throwback posts" and I will be sharing some of my own. Next week, though, is another of the Dog Daddy's.